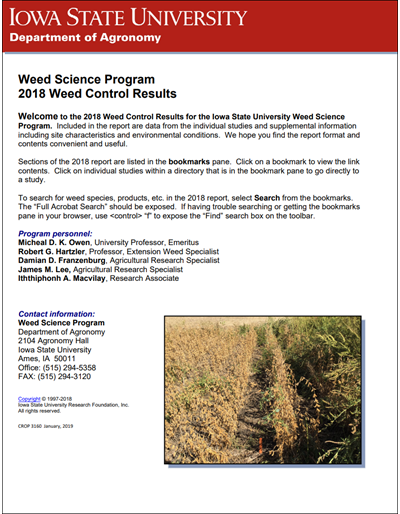 The 2018 Weed Control Results for the Iowa State University Weed Science Program report includes experiments and demonstrations conducted at several of the Iowa State University Research Farms and other producer fields in Iowa. 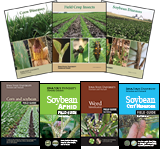 This publication provides information on product and management updates, the role of preemergence herbicides in glyphosate resistant crops, corn and soybean herbicide effectiveness ratings, herbicide package mixes, and herbicide site of action and injury symptoms. Plan ahead. Dealing with herbicide resistance can be expensive. The United States Department of Agriculture estimates the cost of dealing with herbicide resistance once it occurs to be $20 to $60 per acre. Developing long-term weed management plans that reduce the chances of resistance developing will minimize the cost of resistance. However, it's a team effort - farmer, retailer, and industry - working together to delay herbicide resistance. This online, interactive and self-paced course contains narrated presentations, lesson activities and resources to provide farmers and agribusiness professionals the tools to develop long-term weed management plans to help delay the development of herbicide resistance. The materials for this online course were originally developed by Iowa State University and Outreach field agronomists along with weed scientists Bob Hartzler and Mike Owen for a series of face-to-face Weeds Week workshops. The 2017 Weed Control Results for the Iowa State University Weed Science Program report includes experiments and demonstrations conducted at several of the Iowa State University Research Farms and other producer fields in Iowa. Research is ongoing regarding herbicide control methods for Palmer amaranth. The Farm Service Agency is working to approve broadcast herbicide applications to be used in CRP land. 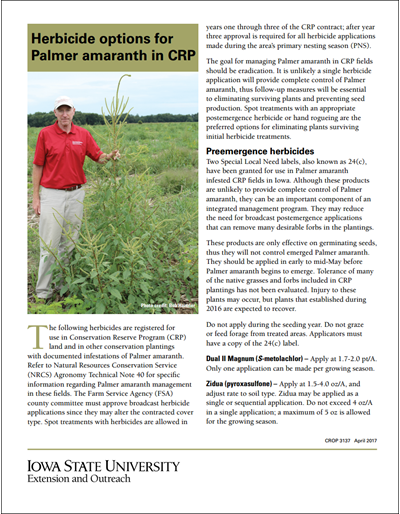 This publication discusses both the preemergence and postemergence herbicides that have been approved to control Palmer amaranth. 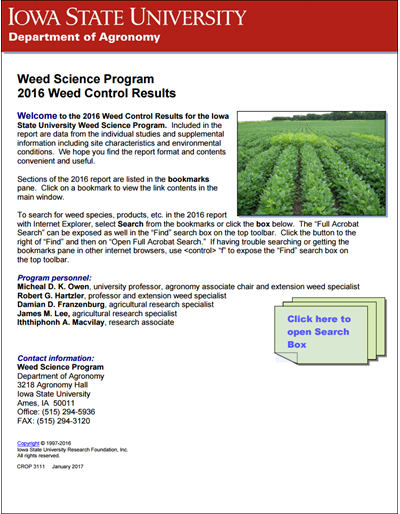 The 2016 Weed Control Results for the Iowa State University Weed Science Program report includes experiments and demonstrations conducted at several of the Iowa State University Research Farms and other producer fields in Iowa. Highlights include experiments that report on herbicide tactics to control waterhemp, with evolved resistance to HPPD inhibitor herbicides and glyphosate-resistant biotypes. 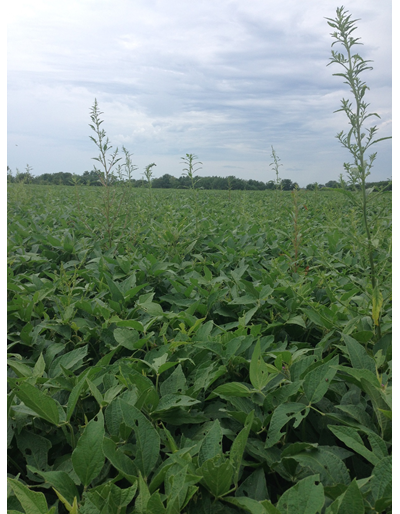 Palmer amaranth has been identified both in crop fields and in conservation plantings using native seed mixes. Early detection is essential in order to prevent the new weed from getting permanently established in fields where it has been introduced. This publication will help people new to Palmer amaranth differentiate it from waterhemp and the other weedy pigweeds found in Iowa. In the accompanying 10-minute video below, Bob Hartzler, Iowa State University Extension Weed Scientist, discusses what Palmer amaranth is, where it came from and provides ways to detect early and what steps to take to eradicate the weed. Crop production clipboards provide a handy way to keep key reference information with you in the office helping customers or scouting in corn and soybean fields. Calibration and conversions supplement plant population charts and growth stages of corn and soybeans. Strip-tillage is when a crop is planted into narrow, tilled strips and the non-tilled area between the strips might contain residue from the previous season's main crop or a living or dead cover crop. Combining strip-tillage and cover crops offers various benefits including minimal soil erosion, maintains soil moisture and weed suppression. This publication provides basic information on using a strip-tillage system with rolled cover crops as a conservation best management practice in vegetable production systems such broccoli, peppers, pumpkins, squash and tomatoes. 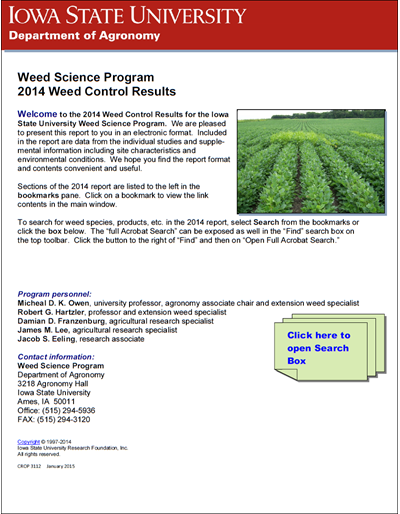 The 2014 Weed Control Results for the Iowa State University Weed Science Program report includes experiments and demonstrations conducted at several of the Iowa State University Research Farms and other producer fields in Iowa. Highlights include experiments that report on herbicide tactics to control waterhemp, with evolved resistance to HPPD inhibitor herbicides and glyphosate-resistant biotypes. The 2013 Weed Control Results for the Iowa State University Weed Science Program report includes experiments and demonstrations conducted at several of the Iowa State University Research Farms and other producer fields in Iowa. Highlights include experiments that report on herbicide tactics to control waterhemp, with evolved resistance to HPPD inhibitor herbicides and glyphosate-resistant biotypes. The 2012 Weed Control Results for the Iowa State University Weed Science Program report includes experiments and demonstrations conducted at several of the Iowa State University Research Farms and other producer fields in Iowa. Highlights include experiments that report on herbicide tactics to control waterhemp, with evolved resistance to HPPD inhibitor herbicides and glyphosate-resistant biotypes. The 2011 Weed Control Results for the Iowa State University Weed Science Program report includes experiments and demonstrations conducted at several of the Iowa State University Research Farms and other producer fields in Iowa. Highlights include experiments that report on herbicide tactics to control waterhemp, with evolved resistance to HPPD inhibitor herbicides and glyphosate-resistant biotypes. 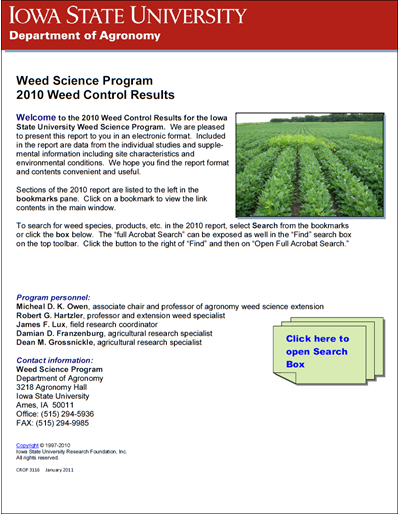 The 2010 Weed Control Results for the Iowa State University Weed Science Program report includes experiments and demonstrations conducted at several of the Iowa State University Research Farms and other producer fields in Iowa. Highlights include experiments that report on herbicide tactics to control waterhemp, with evolved resistance to HPPD inhibitor herbicides and glyphosate-resistant biotypes. 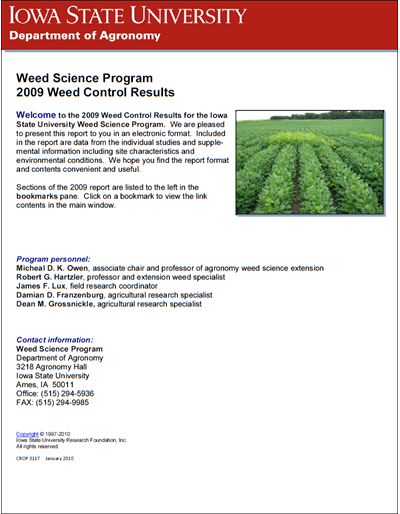 The 2009 Weed Control Results for the Iowa State University Weed Science Program report includes experiments and demonstrations conducted at several of the Iowa State University Research Farms and other producer fields in Iowa. Highlights include experiments that report on herbicide tactics to control waterhemp, with evolved resistance to HPPD inhibitor herbicides and glyphosate-resistant biotypes. Discover biological, chemical and integrated management methods to control aquatic weeds. 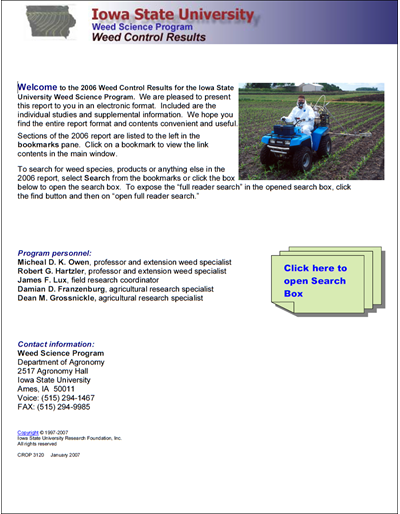 The 2008 Weed Control Results for the Iowa State University Weed Science Program report includes experiments and demonstrations conducted at several of the Iowa State University Research Farms and other producer fields in Iowa. Highlights include experiments that report on herbicide tactics to control waterhemp, with evolved resistance to HPPD inhibitor herbicides and glyphosate-resistant biotypes. Provides information on weed development that can help growers determine the optimum time for tillage and crop planting to reduce weed populations. 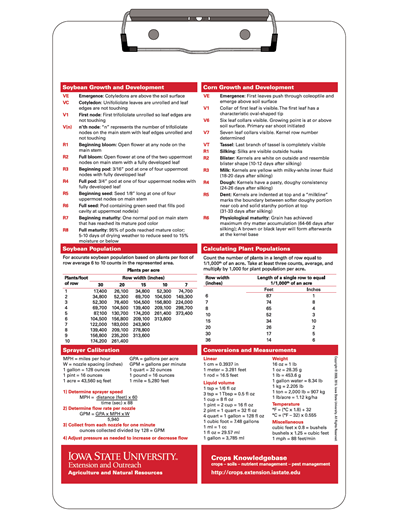 The 2007 Weed Control Results for the Iowa State University Weed Science Program report includes experiments and demonstrations conducted at several of the Iowa State University Research Farms and other producer fields in Iowa. Highlights include experiments that report on herbicide tactics to control waterhemp, with evolved resistance to HPPD inhibitor herbicides and glyphosate-resistant biotypes. 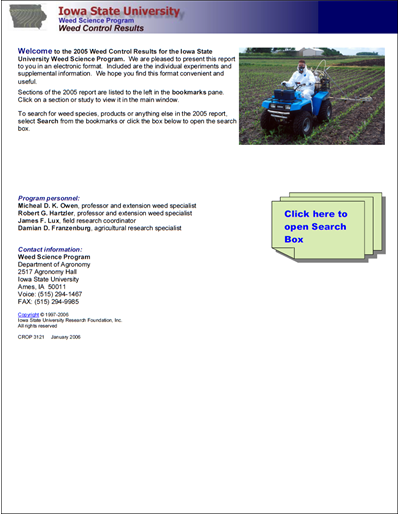 The 2006 Weed Control Results for the Iowa State University Weed Science Program report includes experiments and demonstrations conducted at several of the Iowa State University Research Farms and other producer fields in Iowa. Highlights include experiments that report on herbicide tactics to control waterhemp, with evolved resistance to HPPD inhibitor herbicides and glyphosate-resistant biotypes. 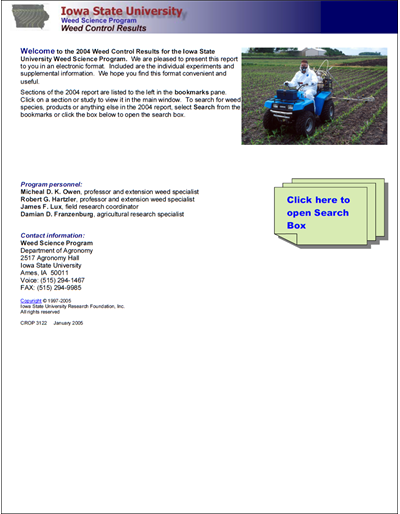 The 2005 Weed Control Results for the Iowa State University Weed Science Program report includes experiments and demonstrations conducted at several of the Iowa State University Research Farms and other producer fields in Iowa. Highlights include experiments that report on herbicide tactics to control waterhemp, with evolved resistance to HPPD inhibitor herbicides and glyphosate-resistant biotypes. These mulches not only provide erosion control, but also fix atmospheric nitrogen. Learn more about five possibiities and their management. Learn about species selection, management, and pros and cons of these cover crops. 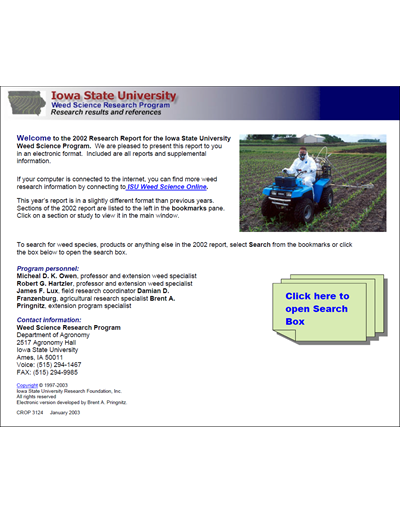 The 2004 Weed Control Results for the Iowa State University Weed Science Program report includes experiments and demonstrations conducted at several of the Iowa State University Research Farms and other producer fields in Iowa. Highlights include experiments that report on herbicide tactics to control waterhemp, with evolved resistance to HPPD inhibitor herbicides and glyphosate-resistant biotypes. 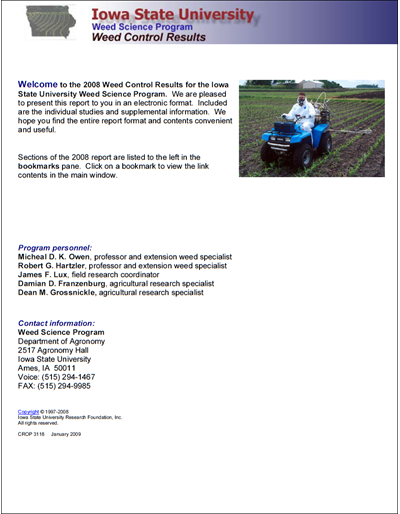 The 2003 Weed Control Results for the Iowa State University Weed Science Program report includes experiments and demonstrations conducted at several of the Iowa State University Research Farms and other producer fields in Iowa. Highlights include experiments that report on herbicide tactics to control waterhemp, with evolved resistance to HPPD inhibitor herbicides and glyphosate-resistant biotypes. Use the colorful pictures and descriptive information found on this poster to identify weed threats for corn and soybean fields. Organic farmers use a wide variety of tools and strategies to control weeds without synthetic chemicals. Those tools and strategies and their effects on soil quality are discussed. 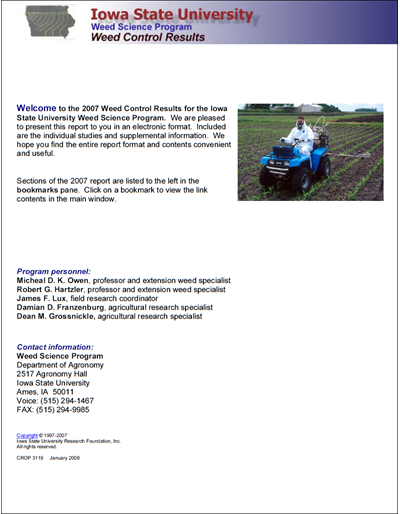 The 2002 Weed Control Results for the Iowa State University Weed Science Program report includes experiments and demonstrations conducted at several of the Iowa State University Research Farms and other producer fields in Iowa. Highlights include experiments that report on herbicide tactics to control waterhemp, with evolved resistance to HPPD inhibitor herbicides and glyphosate-resistant biotypes. 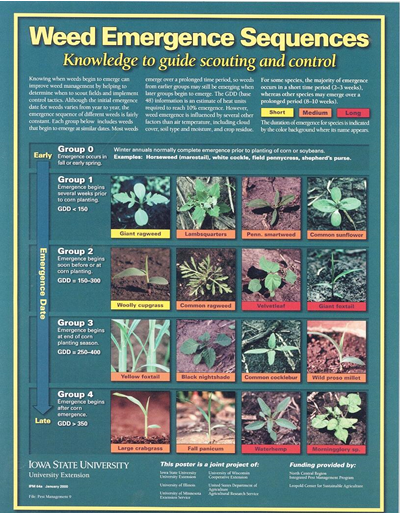 This flyer provides information on when weeds begin to emerge in order to help determine the appropriate time to scout fields and implement control tactics. Pigweeds present many weed management challenges for crop production. 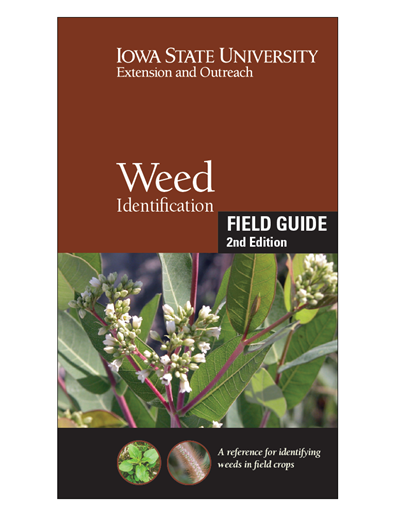 This publication provides producers with information necessary to identify and manage pigweeds common to Iowa. Reducing herbicide rates to take advantage of narrow-row soybeans’ earlier canopy may be a viable option for growers. 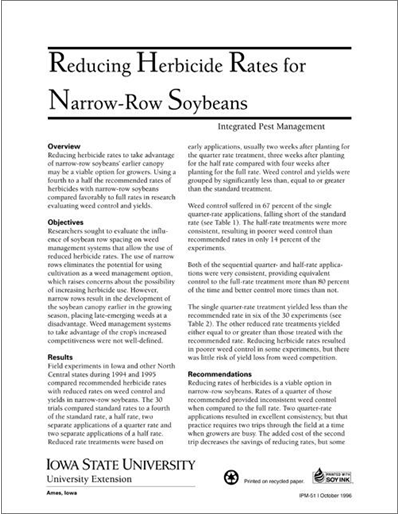 See how using less than the recommended rates of herbicides with narrow-row soybeans compared favorably to using full rates. Common questions are answered about relying on cutivation for interrow weed control. Other weed management factors also are addressed, such as time, weather conditions, erosion control, and cost.